AVON, OH--(Marketwired - Oct 28, 2014) - More than ever, consumers are longing to personalize their homes with DIY projects... especially ones that include painting: a recent homeowner remodeling study uncovered that 70 percent of homeowners complete interior painting themselves*. And whether they gather interest and ideas from magazines, television shows, blogs or Pinterest, they want those projects to be easy to complete and look great. To help bring their design ideas to life and make the process simpler, FrogTape® is introducing Shape Tape™, the brand's first painter's tape cut into unique patterns that allows you to quickly and easily transform your home with paint. 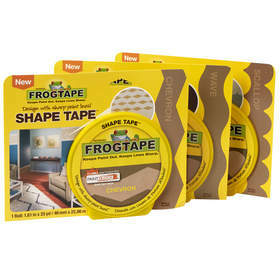 "FrogTape Shape Tape allows homeowners to make unique design choices, while staying within a reasonable budget," said Shelley Price, director of marketing -- DIY tapes, ShurTech Brands, LLC. "Wallpaper and borders can be expensive and limited in design options, while stencil designs can show paint bleed and imperfections. With Shape Tape, it's easy to create the all-over painted patterns and designs consumers are looking for with the crisp, finished appearance of using a premium painter's tape." For easy application, Shape Tape has a slit liner on the back of the tape, which prevents over-stretching and allows application without hand-to-adhesive contact. Simply remove one side of the liner and position the tape as desired, and remove the other side of the liner to secure the tape. Shape Tape can also be used on a number of surfaces beyond walls, including furniture, floors, accessories and more to add personal style throughout the whole house. Like FrogTape, Shape Tape is treated with patented PaintBlock® Technology which forms a micro-barrier that instantly seals the edges of the tape, creating crisp lines and preventing paint bleed. "In the past, it was difficult to obtain a sharp paint line when creating curved designs with traditional painter's tape," Price added. "Shape Tape makes it easy to be creative; it enables DIYers to quickly and easily achieve custom paint results in their own home." Shape Tape comes in a 23-meter roll and is available at participating Canadian Tire locations and Amazon.com with a suggested retail price of $14.99. For more information about FrogTape products, visit frogtape.com. ShurTech Brands, LLC, markets do-it-yourself tapes, office and housewares products under the Duck®, FrogTape®, Painter's Mate Green®, GeckoTech®, Easy Liner® and Shurtape® brands. The company is a subsidiary of Shurtape Technologies, LLC, Hickory, N.C., an industry-leading producer of pressure sensitive masking, duct, packaging and specialty tape products, with facilities in the United States, Canada, United Kingdom, Germany, Mexico, Peru, United Arab Emirates and China. Shurtape services numerous markets, including industrial, packaging, HVAC, professional paint, auto, marine, aerospace, arts and entertainment, and retail. Shurtape also manufactures and markets the Shurtape® and Kip® brands. Visit ShurTech.com for more information. FrogTape Shape Tape is available in Chevron, Wave and Scallop patterns.